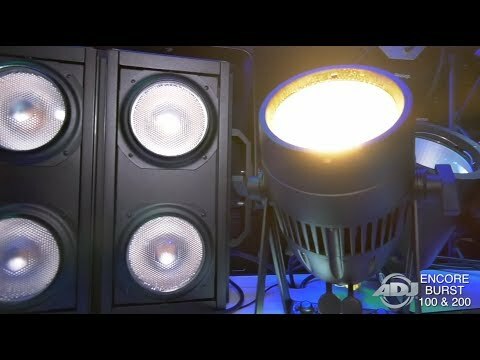 The ADJ Encore Burst 100 IP is a high intensity, IP65 outdoor rated audience blinder/strobe with 125W Warm white (2700K) CREE C.O.B. LED and dim to warm feature. The fixture is constructed of a rugged metal housing. The fixture features a dim to warm effect that replicates a halogen-like dimming profile with a 50-degree beam angle. 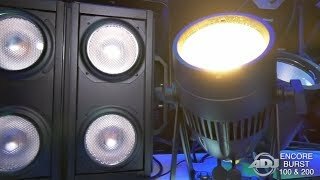 The Encore Burst 100 IP has selectable dimming curves, strobe effect, 4-button LED menu system, 5-pin DMX In/Out plus True 1 powerCON IN/Out to daisy chain power (rubber protective covers over connections). Considering purchasing the American DJ Encore Burst 100IP? Have questions? Ask people who've recently bought one. Do you own the American DJ Encore Burst 100IP? Why not write a review based on your experience with it. Seen a video for American DJ Encore Burst 100IP online or have you own video? Check out American DJ Encore Burst 100IP on DJkit.com!